Using GIS, residential fire locations were plotted with data from the fire service’s CAD system. This problem statement led Thomas and Garis to devise a process for fire prevention education that could be measured. 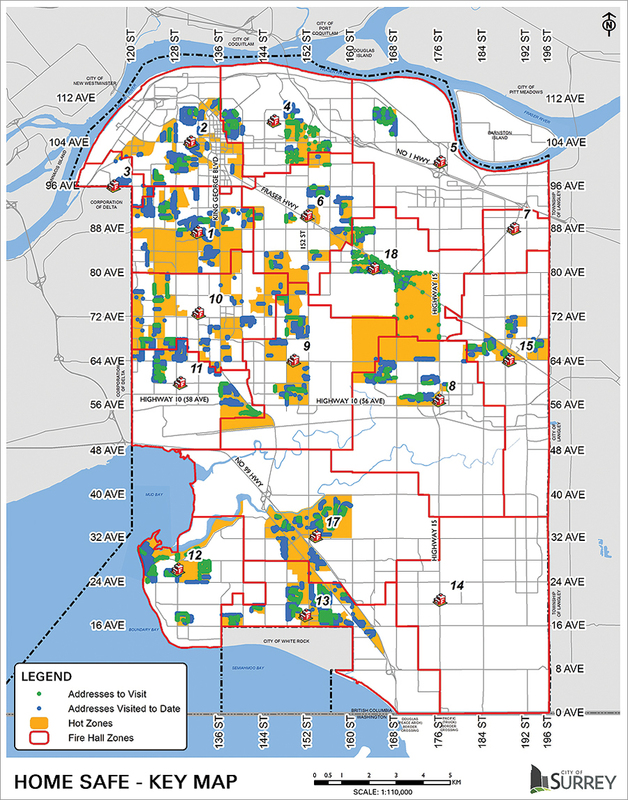 With the assistance of City of Surrey strategic analyst Dr. Joe Clare, they planned a study that directed fire prevention education to targeted homes and developed a means of measuring its effectiveness. They would measure over time if a reduction in home fires occurred in the targeted areas compared to similar demographic areas that didn’t receive the education. To facilitate the study, fire education packages were developed to address the communities’ most common fire causes to raise awareness among the most vulnerable. “So contacting our GIS department for support was essential for the success of our program,” says Thomas. 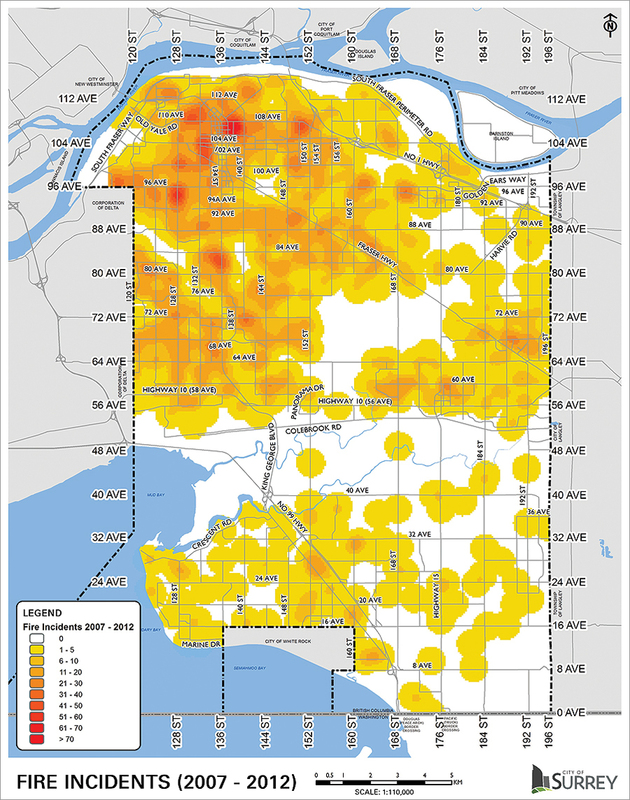 Staff needed to identify targeted and nontargeted areas of similar high fire risk. They used ArcGIS to plot residential fire locations with data from the department’s computer-aided dispatch system. Then census information was used to locate children under 6 years old, adults over 64, single-parent families, and unemployed residents. Census data about dwellings was also used to capture the risk posed for residential structures, such as building age. City zoning data was used as a layer to ensure single-family residences were targeted. “GIS played an extremely important role in identifying the specific high-risk locations so a targeted study could be measured,” says Thomas. “GIS allowed us to use demographic data to identify locations that met the study parameters for risk. It has provided us with the ability to test our theories, measure them, and reduce home fires by using targeted education at high-risk locations. It has given us another tool to help apply a cost-benefit analysis to education initiatives.” The study lasted 25 months, and more than 18,000 homes received the education packages. The results were amazing. Areas that received educational packets delivered door to door experienced a 63.9 percent reduction in home fires compared to preintervention rates of fire per 1,000 homes.